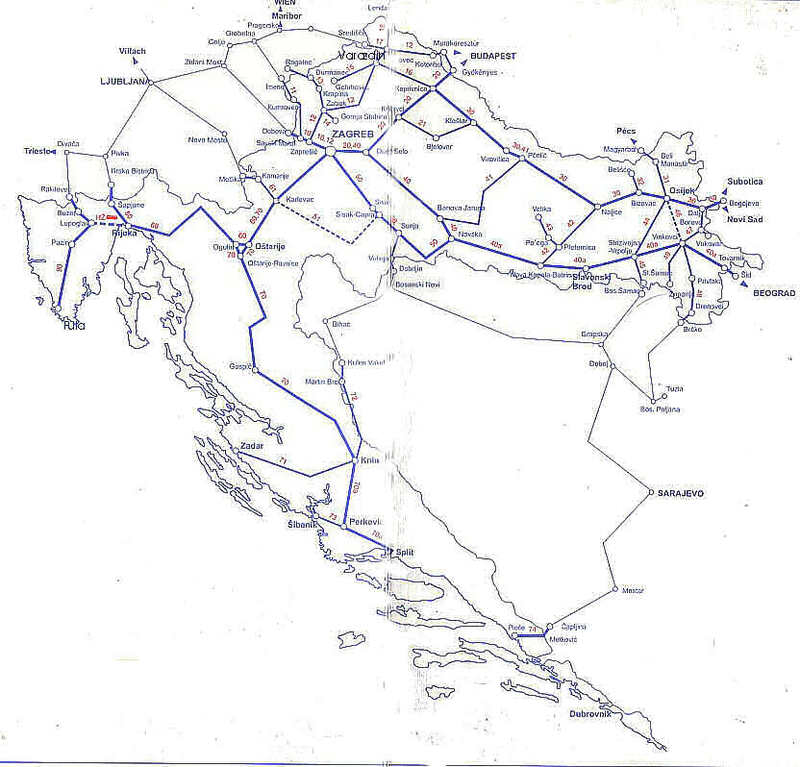 Roads – Go to MapQuest and enter an address to get a custom map of Croatia. Flags – Click on the map of Croatia to see each county’s flag. Counties – A map of Croatia showing each county. 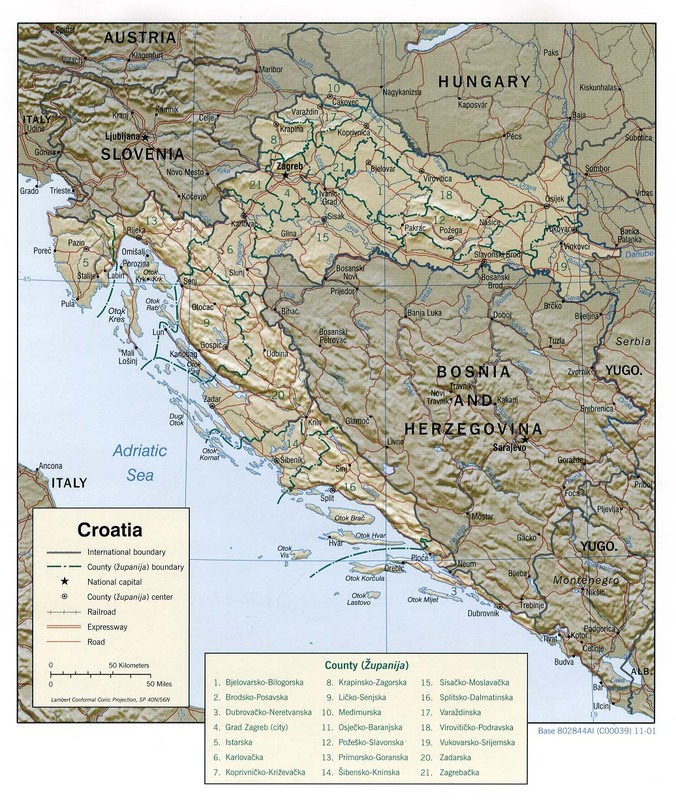 Croatia Political Wall Map – Large high-quality laminated wall map of Croatia. Exclusively developed by Maps.com and GRAPHI-OGRE and not available in any store, this wall map was created using high resolution vector digital imagery with state-of-the-art print on demand technology. Printed on 24lb. premium coated bond paper and laminated on both sides using 3mm laminate through a hot lamination process, this map is markable using dry erase pens and can be easily cleaned. Available in 3 sizes. Croatia – This is a Lonely Planet Travel Guides that explores a destination in depth. Practical advice on getting around and finding restaurants, accommodations and much more. 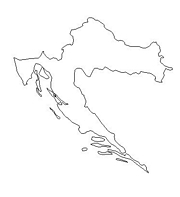 Click here for all Croatia map products – Maps.com! 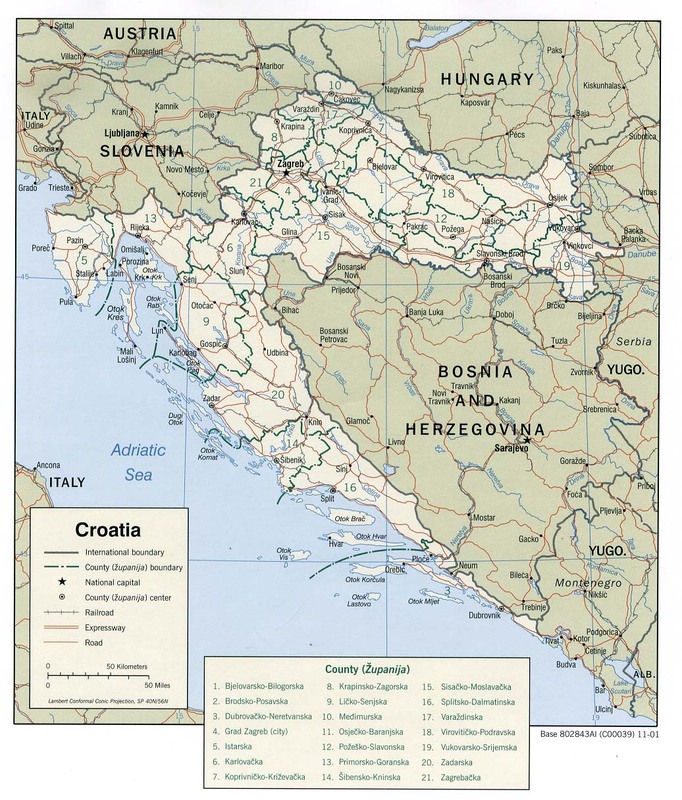 Croatia is located in Southeastern Europe bordering the Adriatic Sea, between Bosnia and Herzegovina and Slovenia. It is geographically diverse; flat plains along Hungarian border, low mountains and highlands near the Adriatic coastline and the islands. Land area is 21,825 square miles and the highest point is Dinara at 6004 feet above sea level. The climate is hot summers and cold winters, except along the coast where the winters are mild and the summers are dry. The lands that today comprise Croatia were part of the Austro-Hungarian Empire until the close of World War I. In 1918, the Croats, Serbs, and Slovenes formed a kingdom known after 1929 as Yugoslavia. After World War II, Yugoslavia became a federal independent Communist state. Although Croatia declared its independence from Yugoslavia in 1991, it took four years of sporadic, but often bitter, fighting before occupying Serb armies were mostly cleared from Croatian lands. Under UN supervision, the last Serb-held enclave in eastern Slavonia was returned to Croatia in 1998. The country’s population is 4,495,904 (July 2005 est. ); 89.6% are Croat, and Serbs make up 4.5%. 96% speak Croatian. Natural resources in Croatia are oil, some coal, bauxite, low-grade iron ore, calcium, gypsum, natural asphalt, silica, mica, clays, salt, and hydropower. Agriculture products include wheat, corn, sugar beets, sunflower seed, barley, alfalfa, clover, olives, citrus, grapes, soybeans, potatoes. Some major industries are chemicals and plastics, machine tools, fabricated metal, electronics, pig iron and rolled steel products, aluminum, paper, wood products, construction materials, textiles, shipbuilding, petroleum and petroleum refining, food and beverages, and tourism.